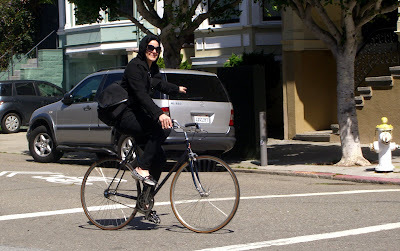 She even smiled for the camera as she stylishly signaled a left hand turn, dressed in black from head to toe, matching her bicycle. The polka-dotted flats and Audrey Hepburn sunglasses made the outfit. that is a lot of black. however, i think her bike was very dark blue! Hard to tell. No way of asking her at this point!